Texas Holdem Table with reinforced legs. You won't find a better deal on the net. TEXAS HOLD'EM Poker Table just like the pros. This table was manufactured with casino quality felt and was made more sturdy than the one we had previously. 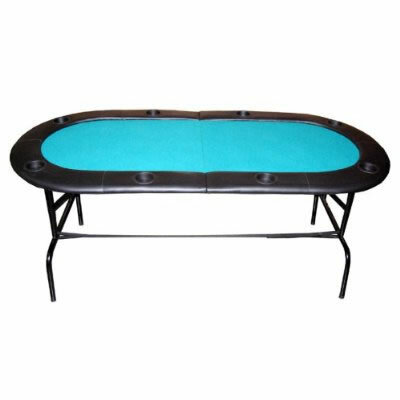 Table size 73" x 42" x 30" Full Size Table 8 Player with cup holders Padded Armrest Padded Felt Top (GREEN) - New Casino Quality Sturdy Folding Legs Easy for Storage This Texas Holdem Table has a full set of bumper pads around the table. The pads are covered with a high grade mildew resistant black vinyl. The table top is produced from a casino style high grade felt. The table top is padded to give the players the highest comfort level. Due to the weight and size of this item, we can only ship to the lower 48 states.